An important part of digitisation work we do is tape restoration. 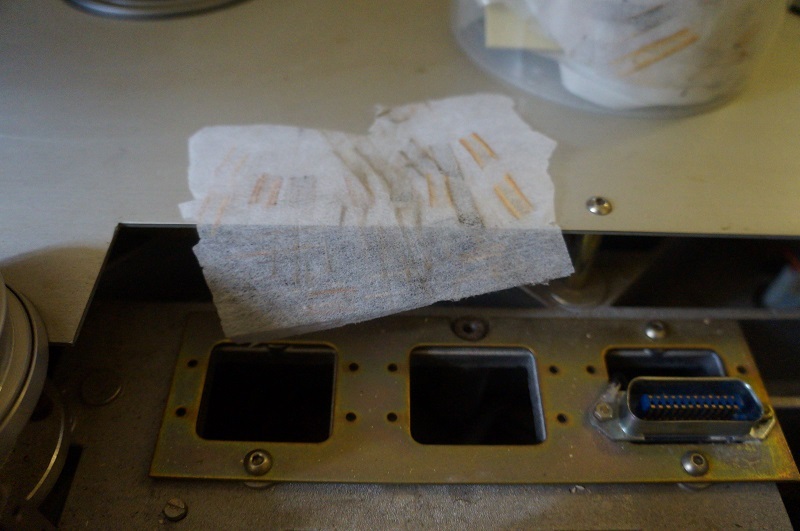 Often customers send us tape that have been stored in less than ideal conditions that are either too hot, cold or damp, which can lead to degradation. Of course most people do not have access to such temperature controlled environments, or are necessarily thinking about the future when they store their tape at home. Sometimes manufacturers recommended to store tape in a ‘cool, dark place’, but often tape is not adorned with any such advice. This leads to us receiving a lot of damaged tape! As we are keen to emphasise to customers, it is possible to salvage most recordings made on magnetic analogue tape that appear to be seriously damaged, it just requires a lot more time and attention. For example, we were recently sent a collection of 3” multi-track tapes that had been stored in fairly bad conditions. Nearly all the tapes were degraded and needed to be treated. A significant number of these tapes were AMPEX so were suffering from binder hydrolysis, a.k.a. sticky shed syndrome in the digitisation world. This is a chemical process where binder polymers used in magnetic tape constructions become fragmented because the tape has absorbed water from its immediate environment. When this happens tapes become sticky and sheds when it is played back. Baking the AMPEX tapes is a temporary treatment for binder hydrolysis, and after baking they need to be migrated to digital format as soon as possible (no more than two weeks is recommended). 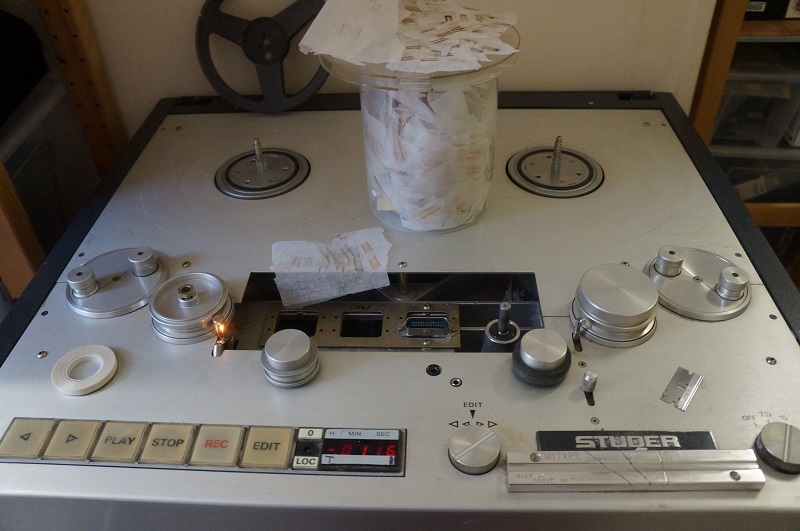 Baking is by no means a universal treatment for all tapes – sticky shed occurs due to the specific chemicals AMPEX used in their magnetic tape. The tapes recorded on TDK were particularly bad, largely because of poor storage conditions. There was so much loose binder on these tapes that they needed cleaning 5 or 6 times before we could get a good playback. We use an adapted Studer A 80 solely for cleaning purposes. Tape is carefully wound and rewound and interlining curtain fabric is used to clean each section of the tape. The photo below demonstrates the extent of the tape shedding, both by the dirty marks on fabric, and the amount we have used to clean the collection. You might think rigorous cleaning risks severely damaging the quality of the tape, but it is surprising how clear all the tapes have sounded on playback. The simple truth is, the only way to deal with dry shedding is to apply such treatment because it simply won’t be able to playback clearly through the machine if it is dirty. Another problem we have dealt with has been the loss of lubricant in the tape binder. Tape binder is made up of a number of chemicals that include lubricant reservoirs, polymers and magnetic particles. Lubricants are normally added to the binder to reduce the friction of the magnetic topcoat layer of the tape. Over time, the level of the lubricant decreases because it is worn down every time the tape is played, potentially leading to tape seizures in the transport device due to high friction. In such circumstances it is necessary to carefully re-lubricate the tape to ensure that it can run smoothly past the tape heads and play back. Lubrication must be done sparingly because the tape needs to be moist enough to function effectively, but not too wet so it exacerbates clogging in the tape head mechanism. Restoration work can be very time consuming. Even though each 3″ tape plays for around 20 minutes, the preparation of tapes can take a lot longer. Another thing to consider is these are multi-track recordings: eight tracks are being squeezed onto a 1/4″ tape. This means that it only takes a small amount of debris to come off, block the tape heads, dull the high frequencies and ultimately compromise the transfer quality. It is important, therefore, to ensure tapes are baked, lubricated or cleaned, and heads are clear on the playback mechanism so the clarity of the recording can realised in the transfer process. Now we’ve explored the technical life of the tape in detail, what about the content? If you are a regular visitor to this blog you will know we get a lot of really interesting tape to transfer that often has a great story behind it. We contacted Richard Blackborow, who sent the tapes, to tell us more. We were taken back to the world of late 80s indie-pop, John Peel Sessions, do it yourself record labels and a loving relationship with an 8 track recorder. Back in 1983 I was a 17 year old aspiring drummer, still at school in North London and in an amateur band. Happily for me, at that time, my eldest brother, also a keen musician, bought a small cottage in a village called Banwell, which is 20 or so miles outside of Bristol, near Weston Super Mare. He moved there to be near his work. The cottage had a big attic room and he installed a modest 8-track studio into it so that he could record his own music during his spare time. The studio was based around a new Fostex A8 reel-to-reel machine and the little mixing desk that came with it. The equipment fascinated me and I was a regular visitor to his place to learn how to use it and to start recording my own music when he wasn’t using it. Skip forward a couple of years and I am now 19, out of school, deferring my place at university and in a new band with an old friend, Simon Armstrong. My brother’s work now takes him increasingly abroad, so the studio is just sitting there doing nothing. Simon and I begin to write songs with the express intention of going to Banwell every time we had a decent number of tunes to record. Over the next ten years it becomes part of the routine of our lives! 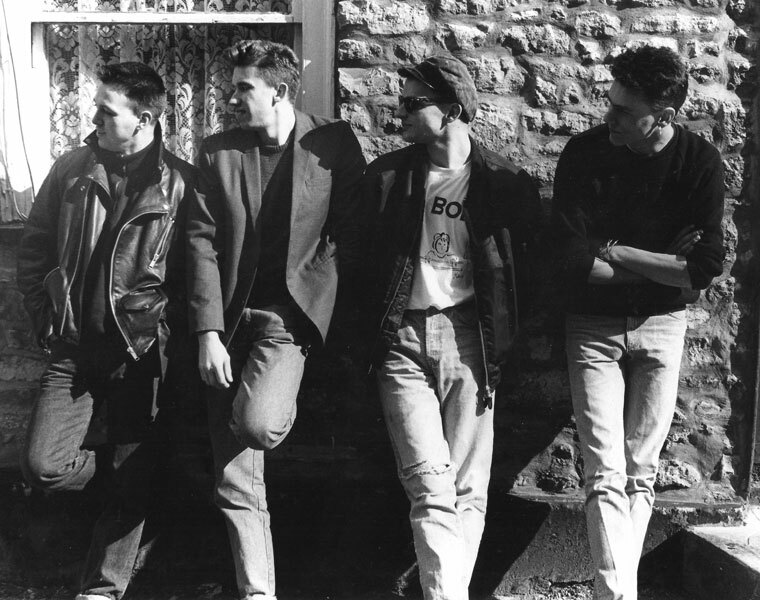 We formed a band called BOB in 1986, and although we still lived in London, we spent a lot of time in that small studio in Banwell – writing, recording demos, having wild parties! By this time my brother had moved to the US, leaving me with open access to his little studio. The band BOB had modest success. John Peel was a keen fan and a great supporter, we toured loads around the UK and Europe and made lots of singles and an album or two, as well as recording 5 BBC sessions. 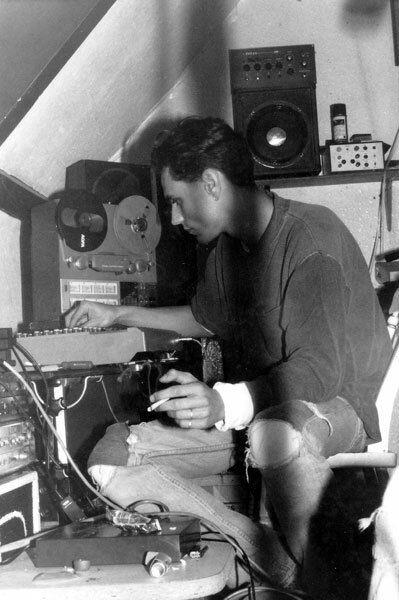 To cut a long story short, we loved that little studio and wrote and recorded some 300 songs over the ensuing 10 years…the studio gear finally dying in about 1995. 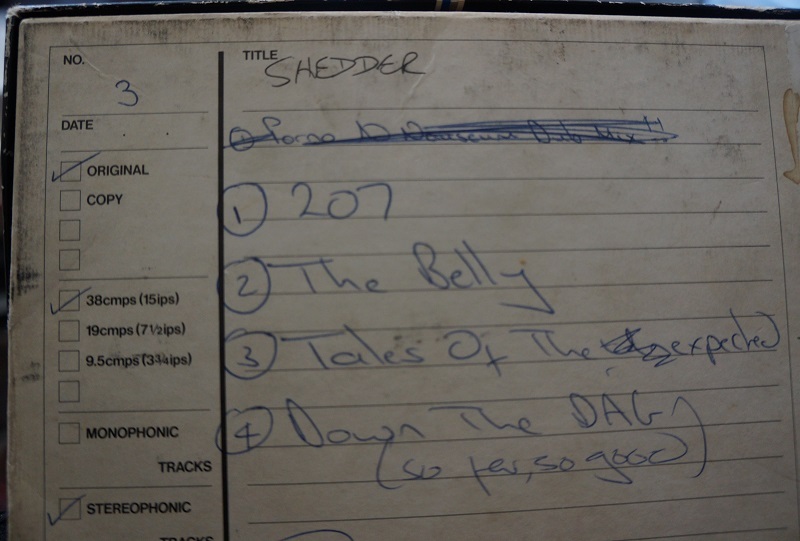 Most recordings were for/by BOB, but I also recorded bands called The Siddeleys and Reserve (amongst others). The tapes we recorded have been lying around for years, waiting to be saved! Recent interest in BOB has resulted in plans to release two double CDs. The first contains a re-issued album, all the BBC sessions and a few rarities. The second CD, planned for next year, will contain all of the BOB singles, plus a whole CD of the best of those demos we recorded. It was for this reason that all of those old tapes were sent to Adrian to be transferred to digital. I now have a studio near my home in West Cornwall, close to Land’s End, where I will be mixing all the material that Great Bear have been working on. The demos map our progression from pretty rubbish schoolboy aspirants to reasonably accomplished songwriters. Some of the material is just embarrassing, but a good chunk is work I am still proud of. We were very prolific and the sheer number of reels that Adrian has transferred is testament to that. There is enough material there for a number of CDs, and only time will tell how much is finally released. This is a bit of a rarity! It’s the demo (recorded on the little 8-track machine in Banwell) for a BOB single that came out in 1989. It’s called Convenience and I wrote and sang it. This early version is on one of the tapes that Adrian has transferred, so, like many of the rest of the songs, it will be re-mixed this winter for digital formats and released next year. This is a link to the video we made for the song back in 1989 in a freezing warehouse in Hull! It appeared on Kats Karavan – The History of John Peel on the Radio compilation that was released in 2009. If you want the latest news from BOB you can follow them on twitter. You can also pre-order the expanded edition of their 1991 album Leave the Straight Life Behind from Rough Trade. It will be available from the end of January 2014. A big thank you to Richard for sending us the photos, his writing and letting us include the recording too! You are currently browsing the greatbear analogue and digital media blog archives for November, 2013.